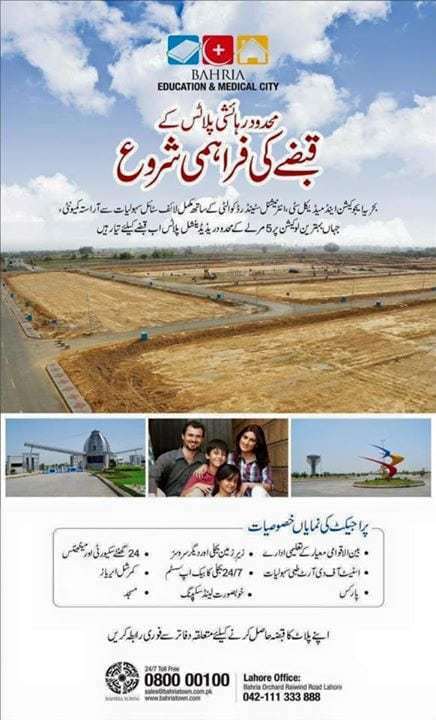 Bahria Town Lahore open possession for limited plots in Bahria Town Education & Medical City Lahore. Allottees are requested to contact Bahria Town Lahore directly for possession procedures. Aslam o alikum all, is BEMC good option to build home and reside in family environment in next two years or still need many more years to think about? Can you tell me that 150 feet road from c block towards LDA city will get a way towards southern ring road in near future ? Is there any shortest way to reach gaju matta matro bus from c block of emc ? How far be the above mentioned destination from c block ? Please let me know thanks a lot? I am not updated with the project EMC. Ali Hassan Bhai, waht is current status of Bahria EMC now? do you think prices will go up further?, and any construction activity? I visited EMC last September 2015, it was ready to possession for 5 Marla plots. all infrastructure i.e. electricity, sewerage line, potable water line, water tank, transformers, street lighting, parks, benches grass, planting their perpanent site office(bahria) were completed. and also works for 8 marla were inprogress some of them were ready that time, I also purchase 8 marla plots that time. I am asking same question about EMC future??? what is the future of Bahria Education And Medical City?? I am not very much updated about Bahria Town Education & Medical City. But possession is granted by Bahria Town. Although location is far away from City as well as Lahore Ring Road. It is Located at Sue Asal Road which link Raiwind to Ferozepur Road Lahore This location will take time, but definitely will pay a good return in long term.